September 28 2018 . 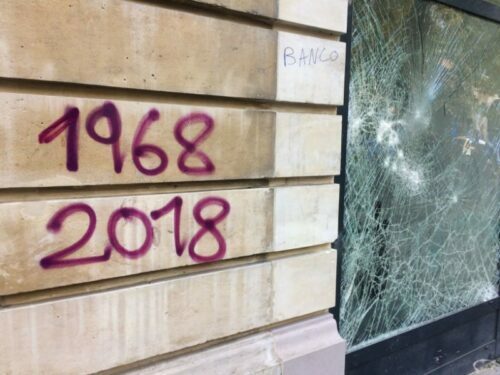 1968-2018 IT’S JUST A BEGINNING! . Dock 61 . Ravenna - ErosAntEros . Teatro di Ricerca . Contemporay Theatre - Compagnia di Teatro di Ricerca fondata da Davide Sacco e Agata Tomsic - Contemporary Theatre Company - Performing Arts - based in Ravenna, Italy. 1968-2018 It’s just a beginning, the struggle continues! “It’s just a beginning, the struggle continues!” is one of the slogans that have invaded the streets in 1968. In the new show dedicated to ’68 ErosAntEros wants to make the past and the present dialogue, to give voice back to the generation that dreamed of changing the world fifty years ago. For this reason, in addition to the protagonists of yesterday’s struggles, we are interviewing some of the protagonists of today’s movements and in this path we met Nicola Lamri, from the spazio MPA Magazzini Anteriori Autogestiti, which we invited to be with us at Dock 61 to share experiences and reflections starting from some of our first working materials. The show WE WANT EVERYTHING! it is a production of TPE Teatro Piemonte Europa and Polo del ’900 of Turin. The debut will take place from 6 to 11 November 2018 at the Turin Polo del ’900: http://erosanteros.org/6-11-novembre-2018-vogliamo-tutto-polo-del-900-tpe-torino/.